The Water Works and Sewer Board of Heflin was incorporated in 1951 and is managed by five Board Members appointed by the Heflin City Council. 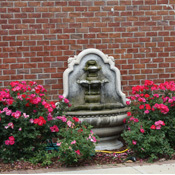 Regular monthly meeting of the Board is held on the second Monday of each month at the business office located in the Heflin Water and Sewer Board Office at 1219 Almon Street Suite F.
Operating under permit by the Alabama Department of Environmental Management, the Water Works and Sewer Board of Heflin acquires drinking water from two sources. The primary source is a surface water treatment plant located on Mountain Street. Water is taken from the Cahulga Creek Reservoir. The drainage basin for the reservoir consists primarily of woodlands and forests providing the Heflin Water Treatment Plant with an excellent and reliable water source. Approximately 1,450 customers are served from this source.